Enda Smith starts at midfield for Roscommon. Enda Smith is back in the starting team for Roscommon. ENDA SMITH RETURNS to the Roscommon starting team for next Sunday’s showdown with Mayo. Smith is named at midfield where he will replace Ronan Stack for the clash at Dr Hyde Park. 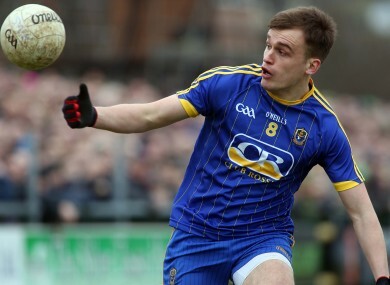 Boyle club man Smith came on as a substitute in Roscommon’s last match against Donegal. Roscommon are chasing a fifth successive win in Division 1 of the Allianz football league on Sunday after recent successes over Kerry, Cork, Down and Donegal. U21 players Ronan Daly, Cathal Compton and Diarmuid Murtagh are all named on the bench. Roscommon take on Mayo in the EirGrid Connacht U21 football final on Saturday 2 April. Email “The Rossies make a midfield change for Mayo game as they chase a fifth league win in a row ”. Feedback on “The Rossies make a midfield change for Mayo game as they chase a fifth league win in a row ”.